Identifying the various AMG GT models from Mercedes, which is already confusing some fans, will only get more difficult in 2019, as the German automaker demonstrates more commitment to further increase its portfolio on the listing. Mercedes AMG GT R Roaster is the latest machine to join the growing GT lineup list and its very first spy photos were only unveiled just before the weekend. It’s just a few months we finally got hold on full details of AMG GT S Roadster, and it would be thought that the GT R Roadster would share lots of design with the S model. Well, that’s completely true. 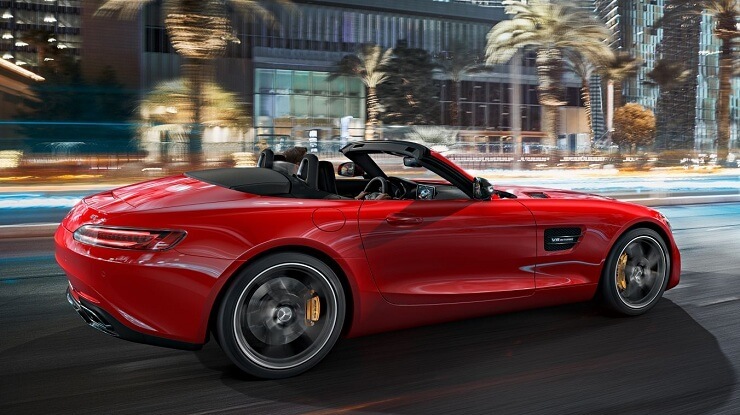 The new Mercedes AMG GT did not also miss out inheriting a few features (at least physically) with the newly released 2018 AMG GT C Roadster since they all share the same platform. We are looking at the AMG GT R Roadster for the first time. It’s not quite different from its base, GT R couple if not that the new variant has fixed wing and a convertible top. Everything looks just like Robert Lesnik and his team’s marks on AMG but the recent physical alterations are taking the 2-door, 2-seat sports car away from a vintage fascia. The GT R is broad, long and looks more aggressive from a rear view. The front grille and headlamp gave the new AMG lineup a more subtle finish. Of course, it didn’t miss the gentle groove by the door sides nor the traditional air vents and those at the rear. The wheels look identical and the tires meaty. We are expecting the same twin-turbocharged 4.0-liter V8 installed in GT R Couple to be found under its bonnet. Mercedes has not really been into power bumping. We are expecting the same performance from Roadster. 580 hp and 516 lb-ft (700Nm) of torque which will allow the Roadster to hit 100km per hour (62 mph) in 3.6 seconds. However, until Mercedes releases full details from GT R Roadster, we won’t know much about the car. But we are not expecting the automaker to effect much change to the AMG GT platform. Mercedes may be responding to the Porsche 911 with the GT, a platform it has several models at varying prices. Certainly not in the area of energy; Porsche 911 prides over 600 hp. Mercedes is only aiming at producing a wide range of options and prices on the same platform. That means it would make more money from a single inspiration and design; supercar owners will purchase the ones they can afford. Mercedes AMG GT was introduced in 2014, unveiled in 2014 Parish Motor Show before it went into sale in 2015 in two variants (GT and GT S). The German automaker has since slowed down GT production until recently. GT R Roadster will only be the latest for a few months; Mercedes is planning to bring GT R Black Series next, followed by GT R Roadster Black Series. We are expecting GT R roadster release date to be sometime in 2019.
iPhone X is the ‘biggest leap’ in terms of technology or leadership?